At the end of a long year, sometimes it helps to reconnect with what motivates your work. 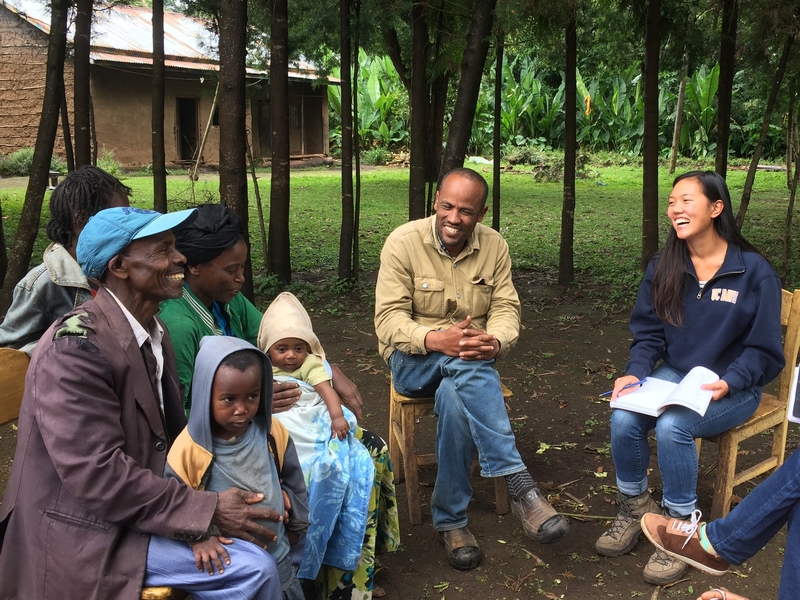 For Karin Albornoz — a Ph.D. student who works in the Diane Beckles Lab at UC Davis on molecular biology related to tomato postharvest chilling injury — that means getting out into the world to work directly with small-scale farmers. "I spend so much time in the lab," she said. "Sometimes I spend a whole day in the lab extracting RNA or writing a paper. This reminds me why I am doing this work: to make a real-world impact." Just over a week ago, she returned from a trip to Uganda where she did exactly that. In partnership with a local organization called Ndibwami Integrated Rescue Project (NIRP), Albornoz shared her expertise with farmers through several hands-on workshops about improving harvest practices and postharvest handling of pineapple, passion fruit and tomatoes. Her work was supported by the Horticulture Innovation Lab, an international agricultural research program led by UC Davis with funding from the U.S. Agency for International Development as part of Feed the Future, the U.S. government's global hunger and food security initiative. Though Albornoz has worked with rural farmers before, this was her first time working in Africa. "Everywhere I looked, things were growing. There were people working in the field, women cooking, and everyone was working with food," she said. "I know there's a lot of stigma – when you talk about Africa, you see people's faces change and they're thinking about things like drought and famine and starving children. But what I saw doesn't fit that stereotype. The challenges they are facing seem to be about not having access to opportunities." 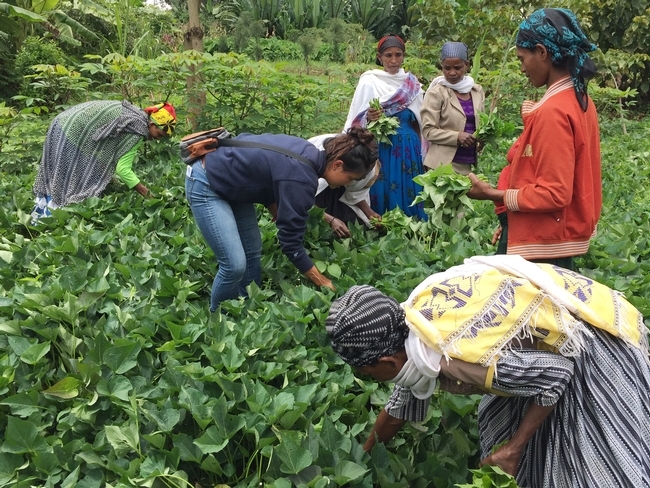 The workshops she led are part of the NIRP organization's efforts to connect farmers with more lucrative markets that pay higher prices for quality produce. In this 2-minute video, Karin Albornoz visits a pineapple farm, leads a pineapple training and discusses next steps for this project led by NIRP in Uganda. The video clips and photos were taken by Karin while she was working and edited by Hallie Casey for the Horticulture Innovation Lab. For months, Albornoz has been in contact with NIRP and making plans for the farmer workshops. She prepared postharvest handling manuals for each crop — pineapple, passion fruit and tomato — and asked questions to better understand local resources and the farmers' existing knowledge. During her 2 weeks in Uganda, she visited farmers' fields and led three full-day workshops. The first workshop for about 50 farmers focused on pineapple — starting with understanding local quality parameters for this fruit, then best practices for harvesting, sanitation, storage and transportation. The second workshop was focused on tomato, with a similar structure, and the third workshop on passion fruit. 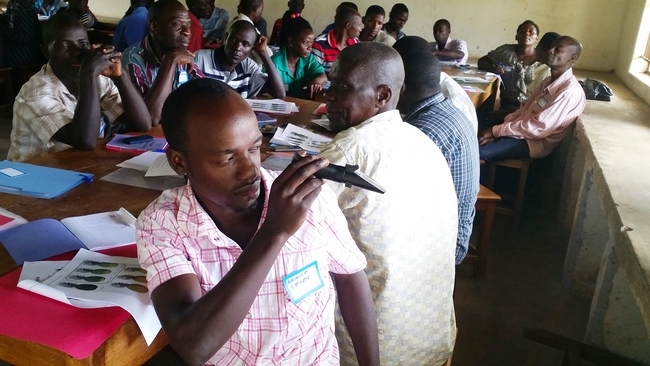 During the pineapple workshop, farmers had a chance to measure the fruit's total soluble solids through a refractometer. Her favorite moment? The farmers' first chance to use a refractometer, to measure soluble solids and learn about sugar levels in the fruit. The refractometers were part of a small toolkit the organization will continue to use. "They were excited to handle this device and see, in numbers, how the sugar levels of the fruit changed depending on the stage of maturity," she said. "Everyone in the room had a chance to try it." 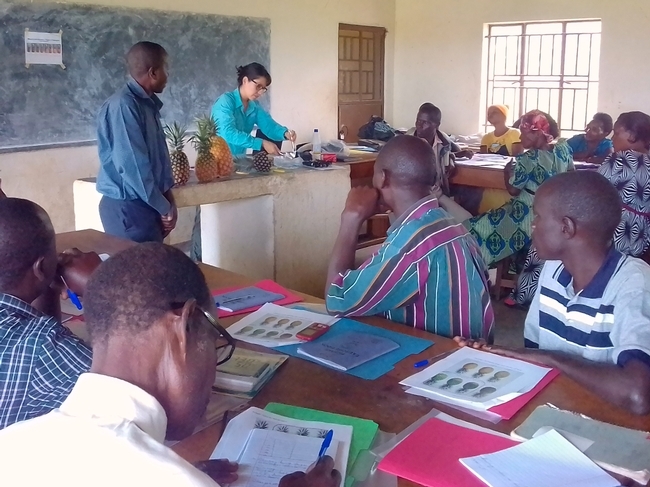 Karin Albornoz leads a workshop in postharvest handling of pineapple in Uganda. The experience reinforced her commitment to working with farmers and solving agricultural problems. "A major mistake is to think that you are going just to train or teach other people because those people are always going to end up teaching you too," Albornoz said. "I made a promise to myself years ago, a personal commitment to working with people in vulnerable situations. I have to do this. 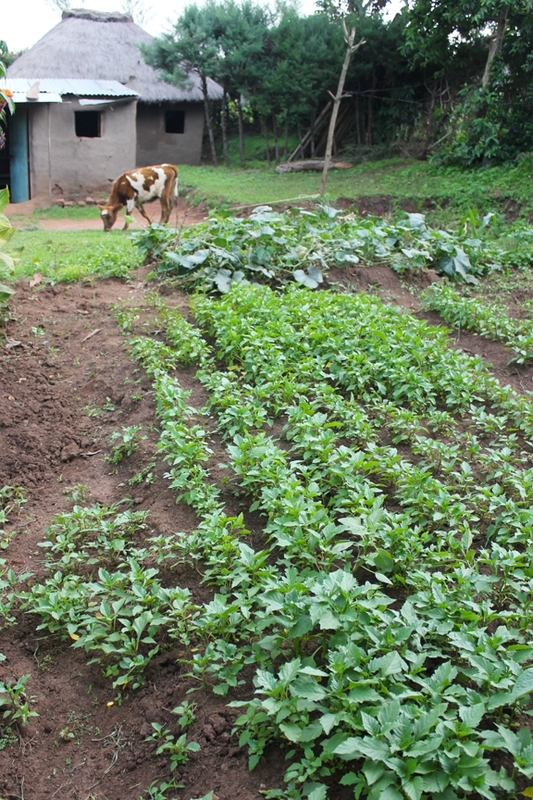 Working in agriculture can be a very powerful tool to have an impact in the world." As Karin's mentor and an Associate Professor in the UC Davis Department of Plant Sciences and Agricultural Experiment Station, Diane Beckles supported Karin's work outside of the lab and views such an experience as important to scholarly development. "Something magical happens when we teach and engage in outreach," Beckles said. "We often deepen our understanding of what we are teaching, and interacting and engaging with others changes us in that process. It alters how we view and think about science in a way that is positive and rewarding, even though it is not easily quantified." 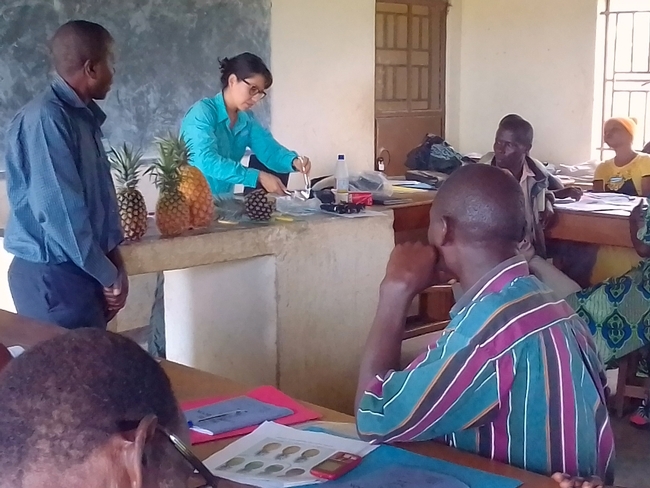 thumbnail: Karin Albornoz leads a workshop in postharvest handling of pineapple in Uganda. 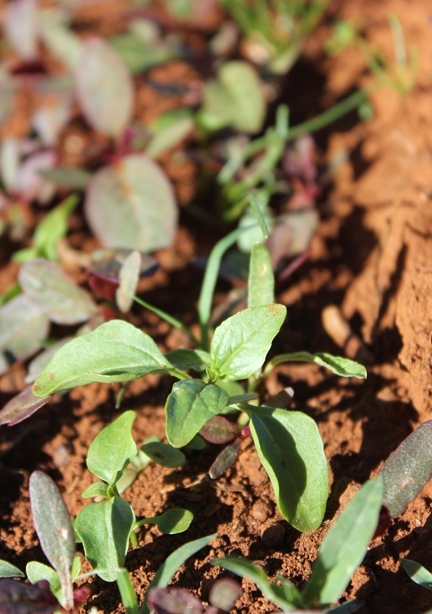 Young amaranth in the field: weed it or eat it? Last week, NPR offered up a novel weed control solution for all those yellow dandelions dotting your lawn: just eat 'em. The article includes a chef's recipe for dandelion flower fritters. The idea that weeds can be edible pops up periodically, with articles suggesting one person's weeds are another person's salad bar, highlighting chefs who “have a way with weeds,” discussing ways medieval gardeners encouraged weeds, and even suggesting ways to eat away at invasive species. But is this something we should take seriously? Sosnoskie's doctoral thesis was on just such a plant, with the tasty name of “garlic mustard.” She has also worked at length on Palmer amaranth, a pernicious weed found in cotton fields that can be glyphosate-resistant. In response to one Georgia farmer asking in exasperation if he should just eat the plant taking over his fields, she did some preliminary research into eating Palmer amaranth. 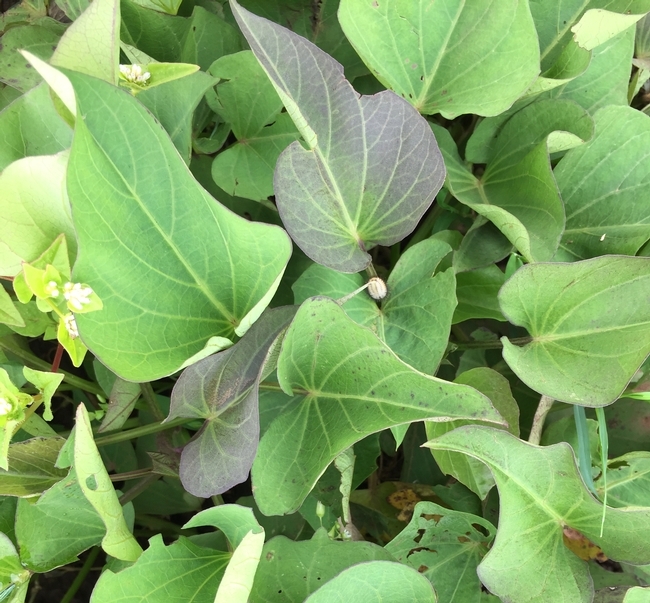 In fact, the Horticulture Innovation Lab at UC Davis has a project that is researching three “indigenous vegetables” in Africa, two of which — amaranth and black nightshade — are considered weeds in the United States. 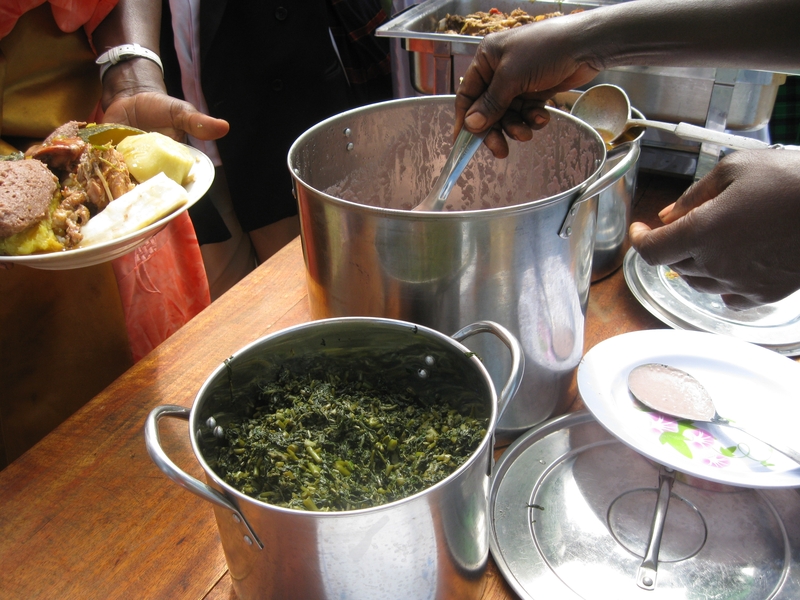 The vegetables can be nutritious and profitable options for small-scale farmers in Kenya, Tanzania, Zambia and elsewhere. 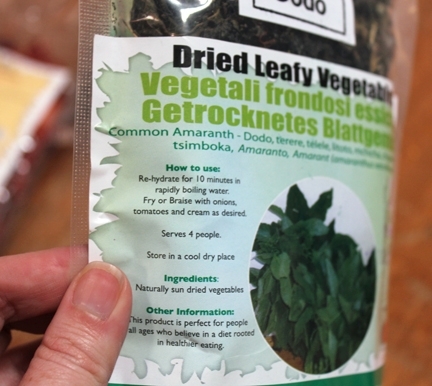 Cooking directions on dried amaranth, from a company in Kenya where it is also known as "dodo." Caveat emptor: Though weedy plants can indeed be a source of food, both scientists cautioned against thinking of weeds as a “free-for-all forage buffet.” Some plants may be toxic, and weeds in farm fields may have been sprayed recently. It is important to be knowledgeable of the plants and how they've been grown before trying to eat one. What will be the new food frontier? 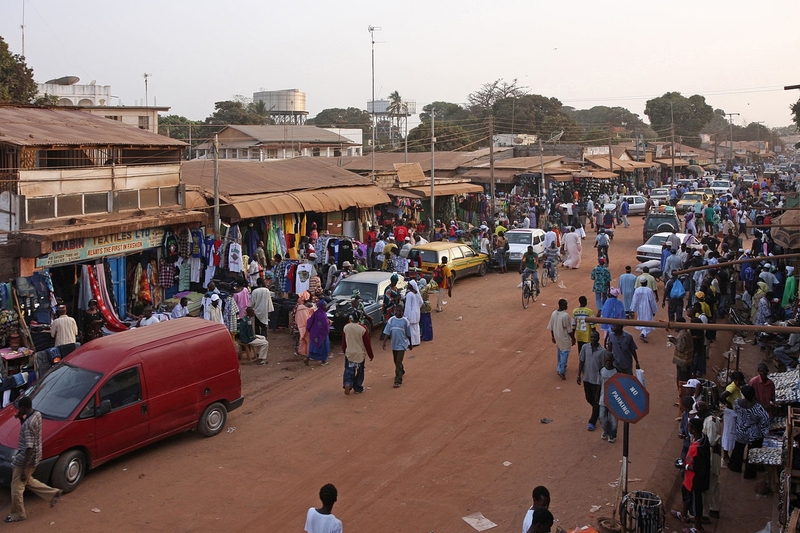 An article in the Wall Street Journal with the headline “Next Stop for Food Fanatics: Africa” predicts adventurous American palates may soon be craving sub-Saharan cuisines. Besides making me hungry, reading this article made me think of some of the African vegetables that I’ve recently started to learn about. Yes, just as there are "Asian vegetables," there is also a wide category of "African leafy vegetables." Nakati (Solanum macrocarpon, S. aethiopicum) Also called African eggplant, some types of nakati are eaten for their leafy greens, while others are eaten for their fruit (which can look like a tomato or eggplant). Cowpea leaves (Vigna unguiculata) This plant produces black-eyed peas, but the greens of the plant can also be eaten as a vegetable. Bbuga (Amaranthus Gracecizans) You might know this plant by its common American name: pigweed. 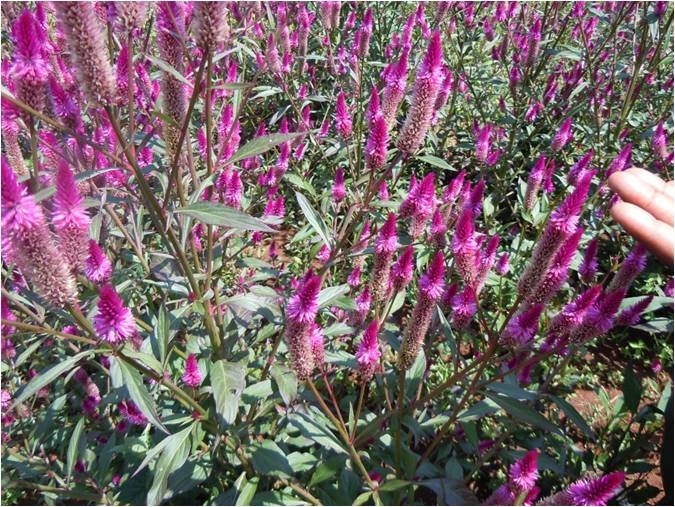 Doodo (Amaranthus Dubius) Like bbuga, this type of amaranth is eaten for its leaves in many parts of Africa. In North and South America, varieties of amaranth are usually used as a grain. Jjobyo (Gynandropsis Gynandra, Cleome gynandra) Also called spider plant. Many of these indigenous vegetables are rich in micronutrients such as iron, vitamin A and vitamin B. 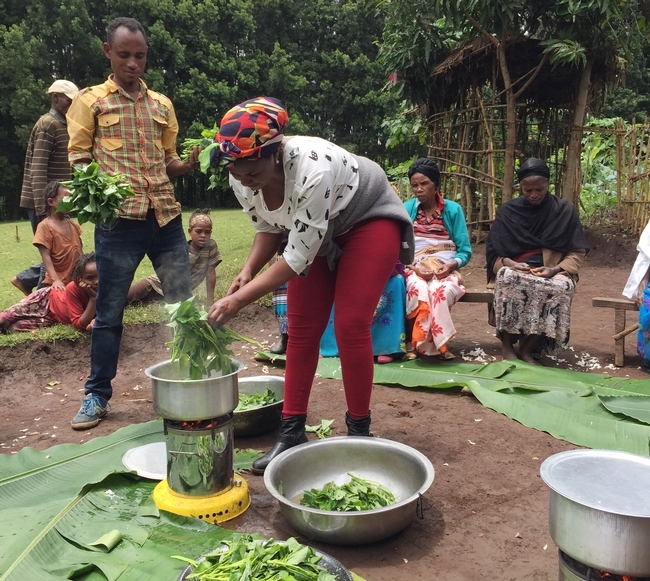 When it comes to alleviating malnutrition in developing countries of eastern Africa, indigenous vegetables offer workable solutions because they are not only nutritious, but also familiar to the region’s eaters and farmers. But research into these vegetables has often not been a priority, even among international development professionals. Markets for these vegetables are also largely undeveloped because they are widely considered subsistence crops, often grown in small garden plots by women for their own families. But growing these crops commercially can mean increased income for smallholder farmers and improved nutrition for consumers who crave traditional foods. Recently U.S. researchers have been working with indigenous crops like these in east African countries — with funding and support from the Horticulture Collaborative Research Support Program (Horticulture CRSP), led by Beth Mitcham at UC Davis with funding from USAID. In Kenya, Tanzania and Zambia, Stephen Weller of Purdue University is leading a Horticulture CRSP research project on production practices, seed resources, postharvest handling, marketing and nutrition of varieties of amaranth, spider plant and African nightshade. 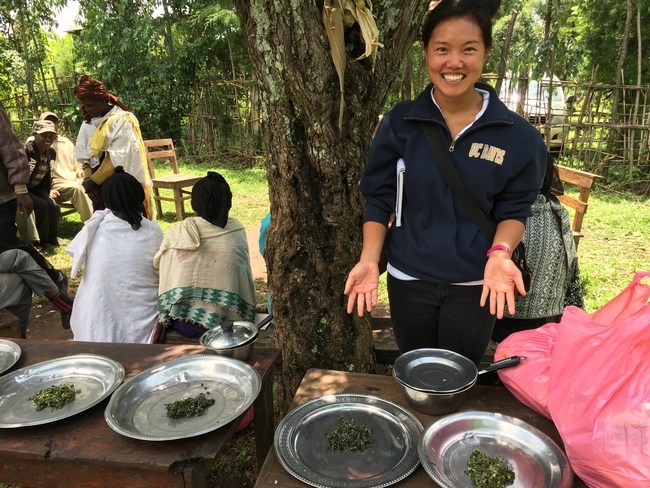 In Uganda, Kate Scow of UC Davis is partnering with local groups to try out a new model of extension while increasing production of indigenous greens, such as nakati, bbuga and jjobyo. Just as bok choy, an Asian vegetable, has become familiar to many American households, perhaps one day you’ll find nakati or another African leafy vegetable on your plate. In the meantime, researchers with Horticulture CRSP are working to get more African leafy vegetables into the research agendas, fields, markets and plates of our counterparts in eastern Africa. Read more abut Horticulture CRSP and its projects around the world at http://hortcrsp.ucdavis.edu.